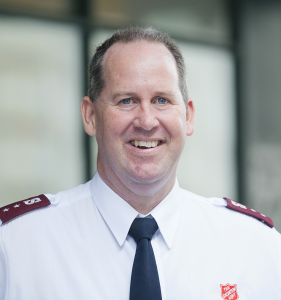 Captain Darren Kingston is Director of The Salvation Army’s Oasis Youth Support Network, an organisation dedicated to improving the lives of disadvantaged and homeless young people in Sydney’s inner city. Darren brings experience from many years of serving with The Salvation Army; starting out as a youth worker in Wollongong before working with young people on the streets of Newcastle and Lake Macquarie. For many years he led a church on the Central Coast which had a Drug and Alcohol Rehabilitation Centre attached to it and for the past three years, he has directed The Salvation Army’s work in Cairns, which included managing 30 staff, overseeing four thrift stores and a number of building programs, as well as being the Public Relations Director for the region. He sees his appointment as Director of Oasis as an opportunity to bring together all of the skills he has had the privilege to learn over the past 18 years in ministry and corporate leadership into one place; applying this to the Oasis Advisory Board and the Oasis Executive Committee to assist in the steady and continual improvements needed to grow the organisation. Darren has also played a chaplaincy role in professional basketball, with the Hunter Pirates, Singapore Slingers and the Cairns Taipans, and was made a National Director for Basketball Chaplaincy. Darren has a passion for God, family and basketball. He has two sons, Joshua and Benjamin and believes Jesus has a plan for His, and everyone’s life and part of that plan is to be at Oasis now.